When opening a program in Windows, sometimes it would open itself in a position outside of the screen. Right-clicking the program on the taskbar does not work. Trying to move it to a new desktop is also futile. Using window key+arrow keys is also not making it appear. What to do then? Below is a way to make the off-screen window appear again. 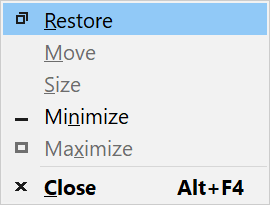 Click the off-screen program icon on the Windows Taskbar to make it the active window. I selected Powerpoint as my active window (highlighted). Type Alt+Space. This will make the off-screen program’s system menu appear on your desktop. Press Maximize. This will make the off-screen program appear on your desktop. Alternatively, you can press Move then press the arrow keys or move your mouse to move the off-screen window to appear. For me the Maximize is faster. How does this problem happen? When using multiple monitors and the program is running on the secondary monitor then either you minimize it or put your laptop to sleep or hibernate, then unplugged the secondary monitor, this sometimes happen. When you try to use the program again it will not appear on your desktop. I have experienced this problem ever since I was using Windows XP, Vista, 7 and 8, and it is still appearing on Windows 10. Hopefully, they would be able to fix this soon.